Today we celebrated Thanksgiving. It was the first major holiday in our new home, and we were privileged to host it for the family. As always, some could make it and some could not, but we had a wonderful time with the ones who could be here and missed the ones who were elsewhere. We had a few challenges getting ready for the big day. The first one was that when you do something in a new house, there is a lot to figure out. The way we’ve done things in the past wouldn’t work in this much smaller house. 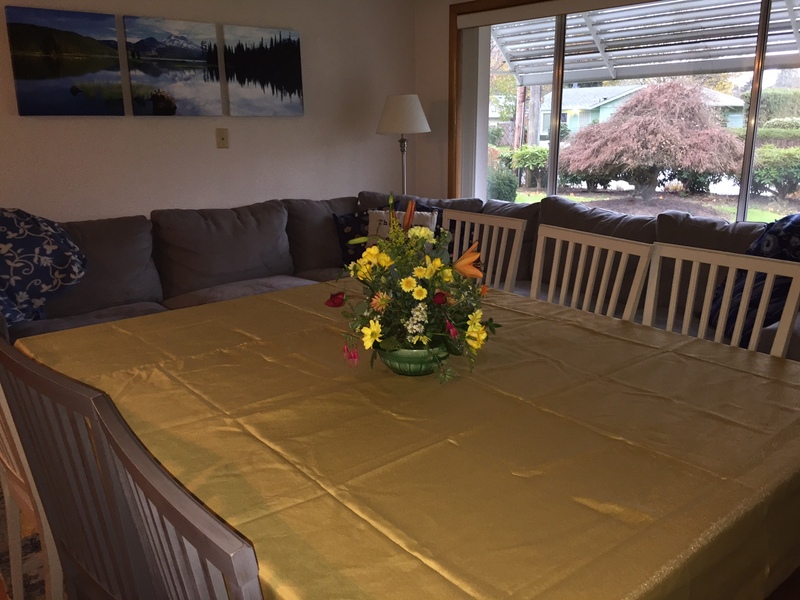 So, we tried out more than one way of arranging tables, and finally settled on an arrangement that looked like it would work. We moved the dining table into the middle of the living room and made it into its larger size. 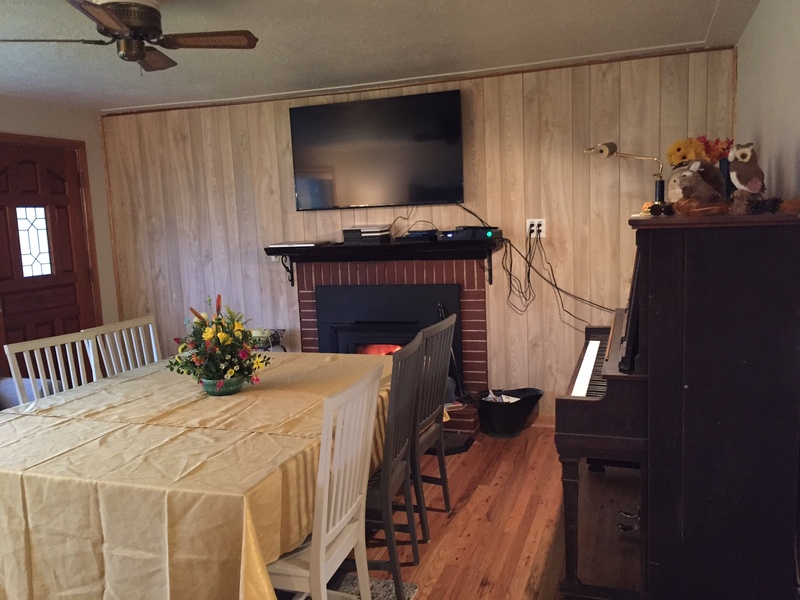 The table in the garage/family room was made as big as it could be made and, after a couple of tries, settled into a place where there would be enough room for people to get seated comfortable. A few easy chairs were placed around with tv trays handy, and we were set. With the table gone from the dining area, we had a nice space for 2 food tables, and some room to maneuver around. As you can see, I finally gave in and brought the old lamp in from the shop. It is still dark in the living room, but the little lamp will do until I get a better one. Another challenge I faced was the fact that we all needed to work a lot more than usual this week. My sister needed to work extra, my brother-in-law did too, and my husband got to work 24 hours in 2 days. All of that meant that I had a lot of quality time with my children, and my nieces and nephew who did not have school all of this week, but had virtually no time to prepare for the holiday. Here’s how we made it work. Everyone who came pitched in. They all brought food and came early and helped finish up. Rob got Wednesday off, and though exhausted from 2-12 hour days, did a massive amount of cooking and setting things up. He did the turkey, a cheese ball, pickle-ham rolls, and set things up. He went shopping, bought whatever he thought we needed (although we did most of it last weekend), and bought me a few bunches of flowers from Trader Joes and put them on the counter. They were my favorite thing he did–I felt so special when I saw that big clump of plastic-wrapped flowers sitting in a vase. I got up early and made stuffed mushrooms, stuffing, ham (in the crock pot), gravy, and arranged the flowers. We used mashed potatoes left over from a youth event my sister cooked for a few days ago, and had several salads, veggie and fruit trays, and desserts others brought. I bought paper “platters” and used real silverware. I borrowed tablecloths from one of my sisters, as I don’t have any that fit this new table. We all took turns washing dishes and put things away as soon as we could, as the counters are small. When everyone was done, several people stayed and helped me put it all away and put the tables, chairs, etc. back where they belonged. Much of it went back out to the shop. Thanks to everyone, I get to sit here relaxing on my bed tonight, basking in the beautiful day we all had, and glory in the fact that the house is clean, I get to rest a lot tonight, and we all have a wonderful day planned for tomorrow! It truly has been a happy Thanksgiving! Thank you! I’m very pleased. I was spending a lot of energy working out the arrangements in my head. Now that it worked so well, it will be easier in the future. I’m glad your day went well, too. Happy Thanksgiving! Beautiful flowers for what sounded like a wonderful Thanksgiving. My parents always moved dinner to the living room when we had holiday meals too. Hope you have a great week! He is sweet. When I got home, there were these slightly bedraggled bunches of flowers all crammed into one vase, in their plastic sleeves. He said, “Trader Joes’s is the place to buy flowers–very reasonable, but hardly any left. 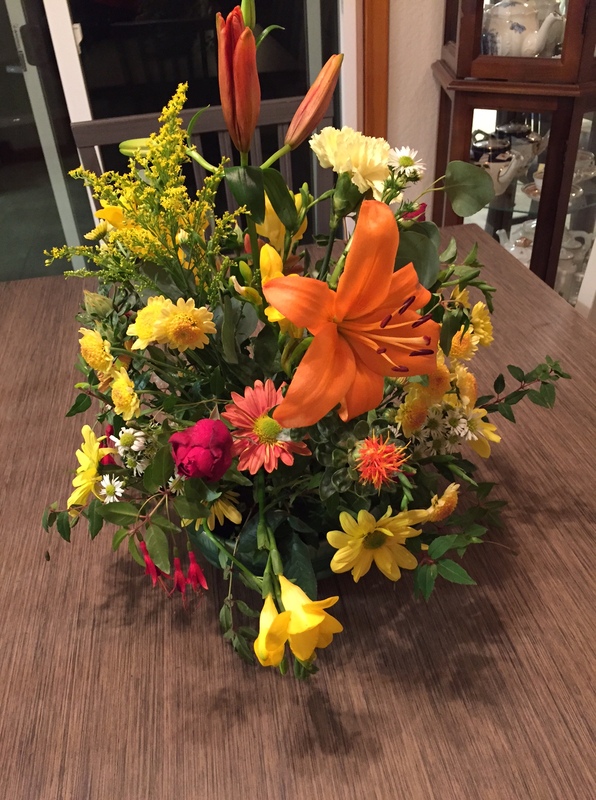 I know you like flowers for holidays.” It was very special to me–probably one of the favorite things about Thanksgiving.